Personalized Golf Tees custom printed with your name, message or logo! Looking for an affordable way to promote your business at a golf tournament? Check out these 8 awesome golf tees and accessories. Personalized Golf Balls and Custom Polo Shirts are two of my favorite and most popular golf related promotions. There is no doubt that both make great giveaways, but not every business has the marketing budget to afford them. If you are looking for a cheaper alternative to golf balls and polo shirts, but still want a high quality giveaway, personalized golf tees may be the perfect item for you! Why do people love personalized golf tees? They're affordable. With some options well under $1, golf tees are an affordable golf promotion. They're handy. You tee off 18 times a round, so golf tees are actually useful. They're portable. Ask anyone who's had to carry 100+ boxes of golf balls which they'd prefer to take to a tournament. There are some great golf sets available. Which I'll get into below. What are some of the cool features available? We carry short tees, long tees, wooden tees, and even eco-friendly tees. When it comes to packaging, we have plastic bags with cardboard tops for large imprints, and matchbook style golf tee holders with a very professional look that businesses love. What if I have a little extra budget to spend? fWell lucky you! If you have a little extra money available, we also carry golf accessory sets, which many of my customers tell me they love. These golf sets all come with personalized golf tees, but many include other customized golf items such as, personalized ball markers, divot tools, balls, and my favorite... a matching zippered bag with carabiner for easy access right on your golf bag. Made from wood and available in 3 sizes, the standard tee is one of my most popular golf tees and perfect for tournaments and trade shows. Made in the USA, this eco-friendly option is also wallet friendly. Add your company name, message or logo and you've got a great golf giveaway. Need more room for your message? Skip the tee printing and take advantage of this large card topper for maximum brand exposure. Enclosed in a matchbook-style holder, this affordable set includes 4 tees and 1 ball marker. Imprint your logo on any or all of these accessories. This popular larger tee set features 6 biodegradable tees and 2 golf ball markers, packaged in an attractive matchbook-style cover. 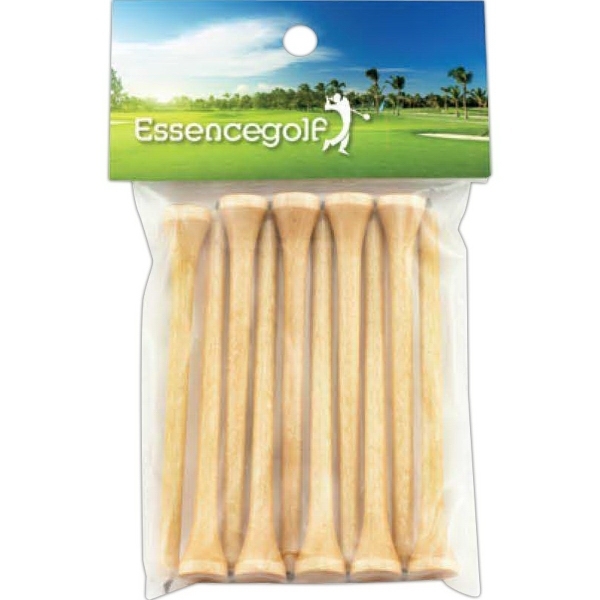 This set features 8 biodegradable peronalized golf tees and a single ball in a unique clear tube. Makes a great giveaway for executives and sales teams. My personal favorite, this golf set includes a ball marker, divot tool, 9 eco tees and best of all... a zippered bag with carabiner for easy access.